The online travel space has been all abuzz thanks to Priceline’s $1.8 billion acquisition of Kayak last week, representing one of the largest deals the space has seen to date. In part, Priceline’s eagerness to scoop up its rival was due to the recent growth of Kayak’s booking path business, particularly in hotels, with the acquisition enabling Kayak to push more broadly into hotel booking, both at home and internationally. While the online (and social) travel space has been contracting a bit after last year’s barrage of new entrants, one of the few young companies that has been able to maintain not only a strong foothold but continuing growth has been social trip planner, Gogobot. Jumping from one million registered users in May to its current 2.5 million+ (and seeing 800 percent growth in its user base in 2012), the startup has continued iterating on its mobile product and focusing on what has traditionally been its strong suit: Quality photos. Today, however, the company is entering somewhat new territory as it begins to expand its scope into adjacent territories, starting with hotels. 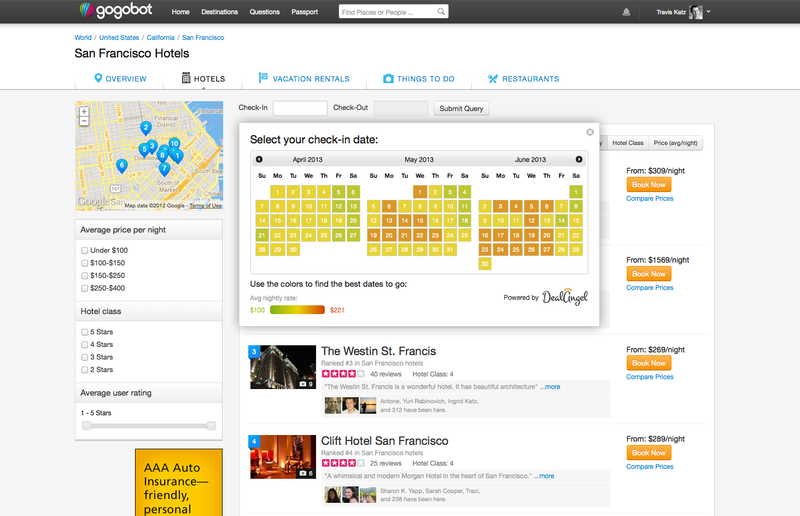 Since launching in 2010, Gogobot has enabled travelers to find great hotels based on what’s popular in their networks; however, with its new features, Gogobot is fine-tuning its search capability by launching realtime pricing tools through a partnership with DealAngel, a hotel comparison startup. 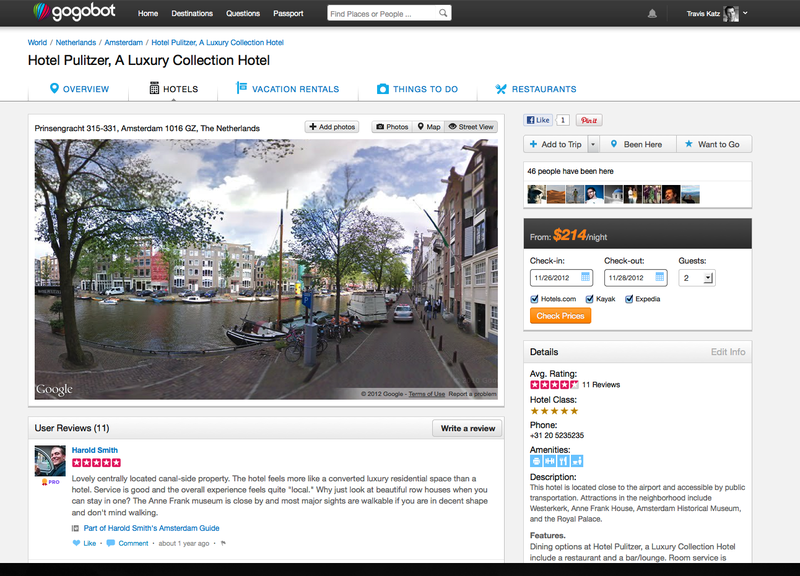 The new functionality essentially allows users to cut through the noise and find some transparency in hotel pricing while researching a trip. With its DealAngel integration, users can now view a color-coded calendar through which they can find the cheapest dates based on average hotel prices and avoid dates when trade shows or other events drive up pricing, for example. 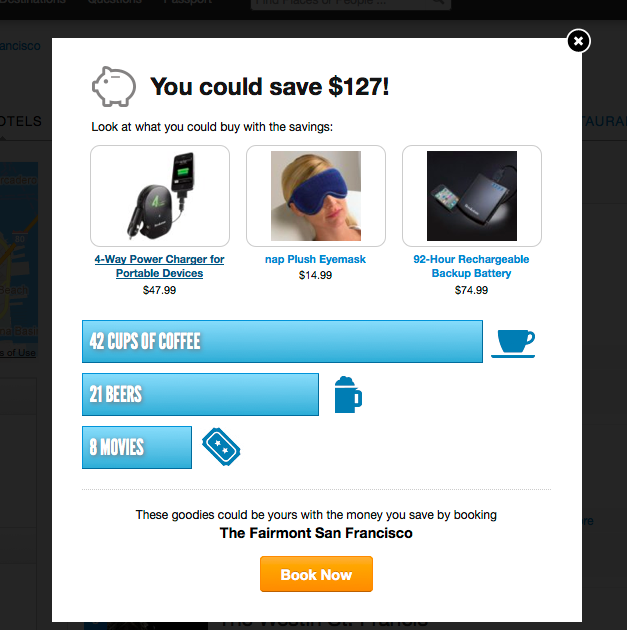 On top of that, the realtime pricing and availability data enables Gogobot users to plug in dates to see actual prices of hotels on the dates they’re traveling and book with a single click, without being subject to those annoying pop-up windows endemic to other review sites. The DealAngel integration also allows users to see how much they’d save by booking on a particular date against actual hotel prices, ranking deals from poor to excellent, again, something that’s unusual to these pricing mechanism, which tend to only provide fair-market prices. For example, if a hotel temporarily drops its price by $100/night, DealAngel’s ranking will highlight that deal for the user, giving them context, with the idea being that they can then make a more informed choice. Alongside its new hotel pricing features, Gogobot is also adding an important tool for all those travelers looking to book great restaurants — OpenTable integration, which now allows diners not only to tap into their social networks to discover restaurants they might enjoy, but actually lock in reservations with a single click via an OpenTable button on each location page. At launch, the OpenTable direct booking will cater to over 26,000 restaurants, with more to be added in the coming weeks. 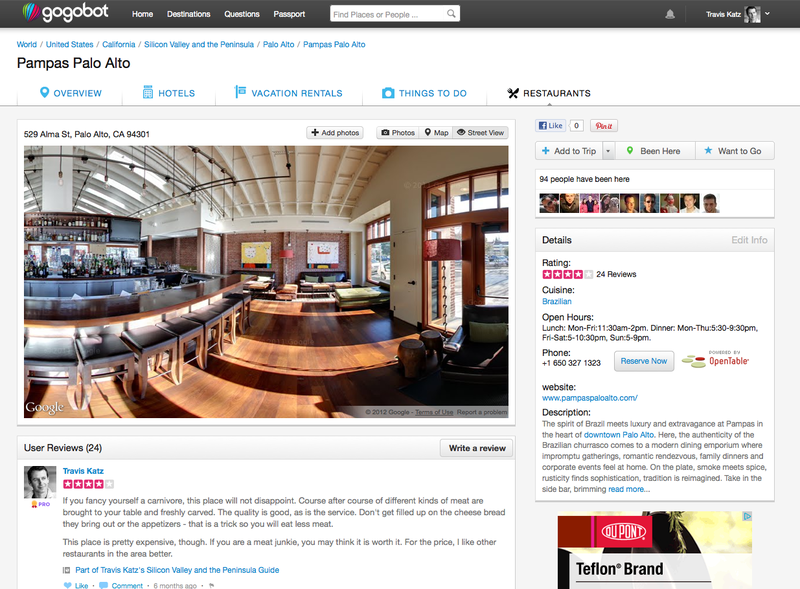 The third piece of Gogobot’s new suite is integration with Google Street View, which now enables users to tap a “Street View” button on each page — from any restaurant, hotel or attraction page to access a 360-degree view of the location. While Street View has become a staple when we’re looking for directions or maps, Gogobot is one of the only travel sites to offer deep integration with Google’s tech. Obviously, this is a key extension to the current Gogobot search experience, as traditionally users have been limited to static, 2-D photos when perusing destinations and cool restaurants. Now users have a better chance of actually discovering whether or not the destination or attraction is something they’d enjoy or might fit into their travel itinerary, enabling them to virtually explore the location. Additionally, users can check out the neighborhood surrounding a couple of hotel choices, so that a business traveler would be able to learn that, hey, there aren’t any bars or restaurants near this airport hotel — better keep looking. And, thanks to Google recently extending Street View to the indoors, users can actually scope out the inside of a potential restaurant, along with getting a more complete view of travel destinations — from Times Square in New York City to Stonehenge. Gogobot founder and CEO Travis Katz tells us that he thinks the Street View integration especially gives the startup a leg up over its well-known, name-brand competition, like TripAdvisor, Expedia and Orbitz — none of which yet allow users to explore neighborhoods and settings around potential travel destinations to find out if it’s actually the right choice. Considering users will be dishing out more than a few dollars for these vacations, in booking their accommodations and culinary pleasures, the transparency in both booking hotels and getting to virtually check out neighborhoods goes a long way in convincing users that the Gogobot experience is actually user-first — not lead-gen-first, for example. Through Google’s APIs, Gogobot already has millions of points of interest ready to peruse via Street View, with more to come going forward — and the same goes for OpenTable. These features are all available to users online and via Gogobot’s mobile-optimized website, with the features hitting the startup’s native apps by the end of the year, Katz says. For more, find Gogobot at home here.